Decision makers frequently need evaluation to help them work out what to do to build on strengths and address weaknesses. To do so, they must know not only what the strengths and weaknesses are, but also which are the most important or serious, and how well or poorly the programme or policy is performing on them. 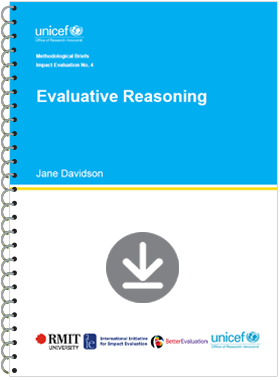 Evaluative reasoning is the process of synthesizing the answers to lower- and mid-level evaluation questions into defensible judgements that directly answer the key evaluation questions.